On 4/24, Prozak will unleash his newest masterpiece, Paranormal – don’t miss your chance to preorder your copy. 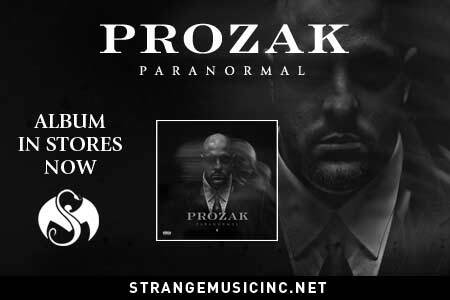 With Paranormal, Prozak takes you on a socially conscious, introspective journey that’s both dark and hopeful – weaving a tale of musical mayhem like only he can do. With tracks like “Until The End”, “The Tell-A-Tale Of Two Hearts” and “Million Miles Away”, along with features from Tech N9ne, Twiztid and Krizz Kaliko, Paranormal will definitely keep you on the edge of your seat. Preorder your copy today and you’ll receive an autographed copy of Paranormal, a limited edition (XL only) Paranormal t-shirt, a 4×4 Paranormal sticker and a bonus download of the song “Last Will And Testament” (a song you can ONLY get with your preorder – it won’t be released anywhere else!!!)! So go ahead, click on the link and preorder your copy – there’s no need to go hunting for it, the Paranormal is right here and waiting for you.